We are proud to announce a BETA release of the DYMO Label Mobile SDK for iOS. The DYMO Label Mobile SDK for iOS is a complete toolset containing libraries, documentation, and samples that make it easy to add label printing to any iOS app. All DYMO LabelWriter and DYMO LabelManager printers are supported. 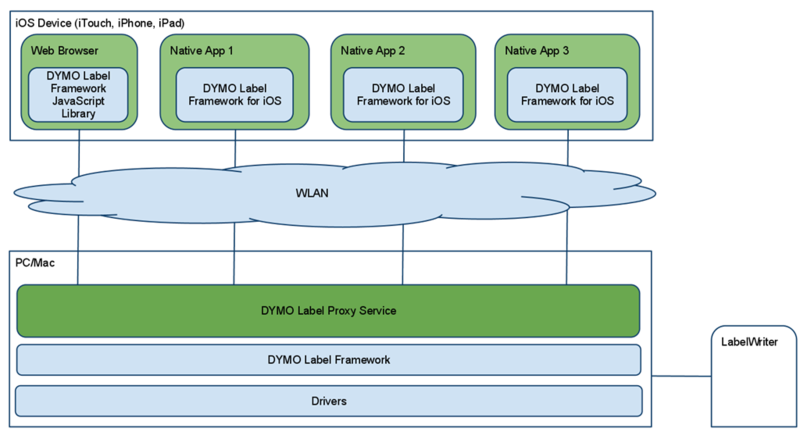 Using the DYMO Label Mobile SDK in combination with DYMO Label Web SDK allows creating both native and web-based apps for iOS. The major piece here is a computer that has a DYMO printer plugged-in and DYMO Label software installed. DYMO Label software contains a service called DYMO Label Proxy that allows communication between a iOS device and the printer. html to be viewed using web browser. com.dymo.label.framework.docset to be integrated with XCode. To install the docset copy it to ~/Library/Developer/Shared/Documentation/DocSets folder. lib – static libraries to link with. Samples were tested in XCode 4.0.2 and XCode 3.2.6 for iOS SDK 3.2 – 4.3. In this case it is necessary to know the service’s ip-address to be able to connect to it from iOS device (see below). The configuration utility can help here as well. Service’s ip-address(es) is displayed in Service URIs list. The first method allows printing of one label only. Use [IDlfLabel setText:forObject:] method to set text data of Address, Text, Barcode, and CircularText objects. Use setImage:forObject: to set image data for Image objects. The second method is more universal, and allows printing multiple labels at once. It is implemented using a “label set” concept. Label set is similar to a recordset, a database table. Label set consist of a set of “label records”. Each label record represents data to be printed on one label. Label record itself is conceptually is a dictionary (associative array), where dictionary keys are label object names, and dictionary values are label object data. To manipulate a label set use DlfLabelSet class. Use addRecord method to add a record into a label set. To set object data in the record, use IDlfLabelSetRecord methods. There are methods to add text and image data similar to ones above. Also, there is way to specify formatted/styled text data where each character or line can have different formatting (font size and style). printer – printer to print the label on. The printer instance can be extracted from DlfPrinters instance initialized previously. This is the only required parameter, all other can be omitted. delegate – a delegate object to receive status messages about printing progress. this might be omitted as well, if print progress monitoring is not important. This method call is asynchronous as well. Right after all necessary data are assembled and printing is started the method returns. Printing progress monitoring can be done using IDlfPrintJob instance returned by the printOn: method (see below). To be able to use SDK libraries to create iOS app a few steps have to be done. The main (and the only one at the moment) library in the SDK is a static library libDymoLabelFramework.a located in the lib SDK folder. To be able to compile and link with the library include path to the headers should be specified, as well as the lib path to the library. add a path to header files. Header files are located in DymoSDK/include/DymoLabelFramework folder. So, add the path to SDK/include into “Header Search Paths” Build Settings of the project. After that the headers can be included into *.h or *.m file by using #import “DymoLabelFramework/DymoLabelFramework.h”. Alternatively the include/DymoLabelFramework folder might be copied into the project source folder. add the library libDymoLabelFramework.a into the project. Add it to “Link Binary With Libraries” group of “Build Phases” tab. DYMO Label Mobile SDK for iOS provides a simple way to add label printing capabilities to any iOS app. Along with DYMO Label Web SDK developers can use DYMO printers from their web-based applications or from native apps. Is the Label Proxy Service available for Mac OS X? The diagram seems to indicate that is it, but the download says differently. As of this Beta, the Proxy Service is available on Windows only. This is great. Thanks for the SDK. Any update on the next beta or when version 1.0 might come out? We are collecting comments from the developers regarding Web, iOS, and Android SDKs. As far as for releasing it, there is no exact date yet. Looking at the low memory crash logs it looks like the app uses a lot more memory when we print images. The printing does actually occur, but things go down hill afterward. Any ideas? Thanks Vladimir. Our image was only 640×480 since it came from the front camera on an iPad 2. We did scale it using [UIImage imageWithCGImage:scale:orientation:], which worked fine in our testing. For whatever reason that alone didn’t help. Weird. Anyway, it works now so we’re quite pleased. We’re using it for an interesting internal project. I had to clean target the project and it worked and printed the dynamic text as required. Hi. Is there ever gonna be a Proxy Service for Linux? It would be really convenient. And where do we send our feedback? Are there any news about the final release date? No, it is in our future plans but we don’t have a determined release date at this time. I’m a bit confused. I’m attempting to make use of the Dymo LabelWriter 450 which is connected to my iMac. I can use the Mac version of the Dymo Label software that came with the printer to create labels and print them. I’m developing an iPad app that needs to print labels. In Xcode I use the UIGraphicsBeginPDFContextToData(labelData, CGRectZero, nil); and related functions to then pass the NSData object that is created to a UIPrintInteractionController. A label advances as if it had printed but there is nothing on it. This happens through the simulator with an app running on my Mac that makes the printers connected to the Mac visible to AirPrint. So, am I to understand that the only way to print a label on the Dymo printer is to have a proxy service running on a Windows computer? If the Dymo Mac software can print right to the printer without a Windows proxy, why doesn’t the sdk print to it? The DYMO Label Mobile SDK for iOS provides a simple way to add label printing capabilities to any iOS app. Along with DYMO Label Web SDK developers can use DYMO printers from their web-based applications or from native apps. 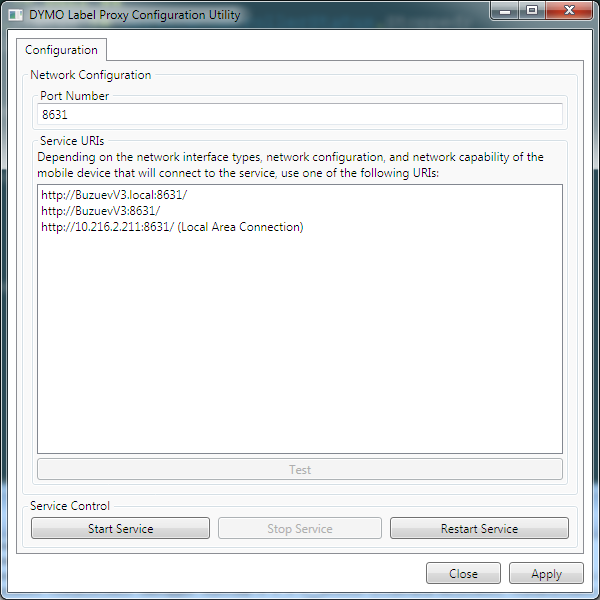 The DYMO Label Mobile SDK requires a DYMO Label Proxy which is currently available for Windows only. FWIW, I print to a 450 via Printopia in an iPhone app by creating my own UIPrintPageRenderer and implementing – (void)drawPageAtIndex:(NSInteger)index inRect:(CGRect)rect. This does not require any iOS SDKs, just an airprint printer, which Printopia provides/proxies on a Mac. Printopia is important (for me) in that it provides a way to provide the label size to the app which other airprint proxies I looked at did not do. (See https://help.snapsly.com/entries/21186296 for my instructions for my app users on Printopia setup). This works well for me when trying to print something I already have in a UIView. Not sure about other variants, e.g., PDF. it’s not working on Windows 7.
even on your test app. we ordered about 200 dymo 450 turbos. please help, need to make it work. I am trying to add label printing to from a custom iOS app and came across this. However it does not look like this has been updated in a long time and I am having a hard time even getting the samples to work. I can not find the DYMOLabelProxyServiceConfiguration.exe utility in order to get the iOS sample app to locate the 400 Turbo I have setup. It looks like this has been removed from the install and now I can only find DymoPNPService… Any help in getting a sample up and running so I can work off of that would be great. Any updates on this ? Are you planning on releasing it and get out of Beta ? We are currently working on our project road map and no date has currently been set to move the iOS SDK into production. However, you are free to use the beta SDK in your applications. No, there hasn’t been any updates to this project. Unfortunately 64-bit code can’t call 32-bit code and vice versa. Currently we don’t have any plans to do any work on iOS SDK (beta). If the iOS SDK is no longer being developed, how about putting the source code on Github so that the community can improve and make it 64-bit ready? The iOS SDK is embedded in DLS and can’t be extracted easily. Furthermore DLS isn’t a open source project and DLS is still being developed. The 64bit support for iOS SDK might be added later. I am trying to add support for the DYMO LabelWriter Wireless to our iOS app. This is the only SDK I have found on your site. I see you have an iOS app that can print to it, will the SDK be available sometime soon? We have on our long term plan the addition of an iOS (and Android) SDK. Unfortunately, there is nothing available at this time. You could create a proxy service on a Windows/Mac device for printing, if that works.